A Carnegie Medal winner tells the true story of the Victorian orphan boy whose plight inspired Dr Barnardo to set up his famous children’s refuge. Jim Jarvis is a runaway. He has fled the dark and terrible workhouse where he was dumped when his mother died. But 1860s London is a dangerous and lonely place, and life is a constant battle for survival. Just when Jim finally finds some friends, he is snatched away and enslaved by the cruel Grimy Nick. Constantly watched and hounded by Nick’s vicious dog, Snipe, will Jim ever be free? This book is very touching I will not explain a lot of this book if I do there is no point of reading it so all I am going to say is this is based in the Victorian times. we read this before and I Nearly started to cry because this is so sad but really good! It is very enthusiastic and it is very heart breaking the boy doesn’t get anything to eat only a piece of stale bread each day well I actually mean evening. His mother is very mean to him. He is very sad it is very good you should read it! I rate it as a five loved it really nice I rate this to you all. Please do reply If you love books like street child. It is very funny as well so yes read it. I read this book with my class when we were learning about the workhouse. We had found the book really interesting. This was a really good book. It is very nice story. We all had started reading Street child. I loved it and it is very true story about Jim Jarvis. I really liked this book and I thought it had great description of Jim Jarvis. Reccommend this to everyone! We were read this in year 4 and it was a great book!! I read this book a while ago, and the story is very intriguing. Definitely worth a read if you like history, or the Victorian era. It’s the modern-day take on Oliver Twist. This is a wonderful book. It is set in Victorian London. It is about an orphan, Jim Jarvis, who escapes a workhouse but faces many challenges. I liked this book as it shows what life was like for the Street children in the Victorian era. I recommend this book for all ages. this book is good and a intresting read i recomend this book ages 12-100!!!! very good! This is an amazing book and i read it only a few years ago but i still can imagine the story in my head noe.This novel is full of emotion and mystery in how Jim survives and struggles. Street Child is a really good book! I love the detail it goes into when describing the workhouse. We read it at school when learning about the Victorians. I read this book in school it is amazing! I loved this book. I would tell everyone to read it. This book was very moving and made me think about the differences from now and the victorian era! I REAAD THIS WITH MY CLASS AND I THOUGHT IT WAS GREAT!BUT IT MADE ME WANT TO CRY!!!!!!!!!!!!! i loved this book !! We read this book in class and it was so amazing! We loved every bit of it and one day we read 10 chapters in one day and still never got bored. At first we never knew it was based on a true story! This book makes you want to read it more and more! Some boy in my class didn’t like reading books now he never wanted to stop reading it! Some bits are so moving, like Grimy Nick, Shrimp, Rosie’s Granddad,Tip and the work house. BEST BOOK EVER! I done this book with my class! I loved it and it was very interesting. THIS WAS A GOOD BOOK BUT IT DIDNT MAKE SENCE TO ME I DIDNT KNOW WHERE HE WAS OR WHAT HE WAS DOING IT WAS OKAY BUT NOT FOR ME IT NEEDS PICTURES SO PEOPLE CAN UNDERSTAND IT BETTER. in class i am reading this book and i think that its a great book but its a bit sad now i`m doing drama too . I am reading this bookin class. Loved this book read it in class one of the best books i have ever read. Read this in class and it was mazing😃 Overall awesome book!! A great fiction story about a non fiction boy, Jim Jarvis and his life living on the streets and workhouse. not a bad book even though i only read a little. i would recomend it with the reviews i have read. I read this book in class and it was AMAZING, I lOVED it. I read this in my class in school because we where finding out about victorian life BUT ITS SO SAD BUT THE HOLE CLASS LOVED IT THOUGH!!! This book is quite exciting, but nothing happy ever happens until the end! It’s all quite sad. I loved this book. A real heart rending story! I think that this book is very thoughtful and heart breaking to me. It makes me think about the book a lot because of the way it is written. The book is old but it is still original as if it is written now. When Jim Javis’s family find it hard to live, so their mother sends her daughters away and Jim to the workhouse. Will Jim manage to escape? The best book I ever read! I am reading this as a class novel and it is great, well what I have read of it anyway!!! It is about a poor Victorian boy who is shoved into a workhouse. I love this book. i have this in school and its great. I read this book in Year 5 and loved it, I want to read it again and again. my opinion is that it is a really interesting/sad book about a poor Victorian family who gets split up. Extremely good book I enjoyed it so much it was wriiten perfectly. Read it go on. street child, really an interesting name, it’s just so exciting, i want to wake up in the morning and find it next to me. my father promised me he is going to buy it for me in my birthday. this book is asome! !if you don’t hav it then get off your lazy but and BUY IT!!!!!!!!!!!!!!!!!! This book is great i read it in school but it is a very sad book and it was actually true i hope jill and his two sisters okay but i feel really sorry for there mum because she died. 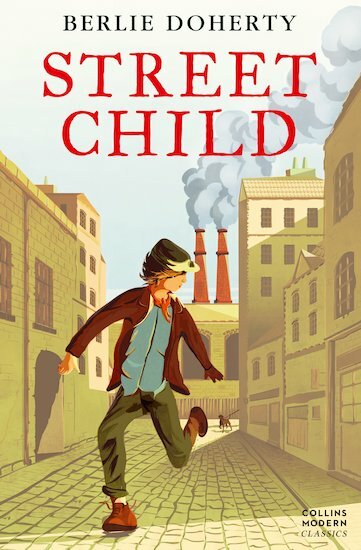 Street Child is a great book, because it is very sad thinking about Jim Jarvis who was based on a real childs story. this book is great my teacherread it to our class i would 100 pesently reccomend this book by AMELIA i loved so i would give this 3 million stars.